The authors of the book Velocity recognize that only with a combination of the main logistic manufacturing theories you will get the breakthroughs you need in today’s competitive environment. This is a big plus, since the literature I studied so far kept especially Lean and the TOC strictly separated. Until now, it was like you had to choose between the Beatles and the Rolling Stones! In my opinion, this book about achieving breakthrough performance is also a breakthrough in manufacturing theory. However, there is also a minus: The examples of Lean and Six Sigma are weak and don’t show how these methods can really accelerate a TOC implementation. This is a missed opportunity. 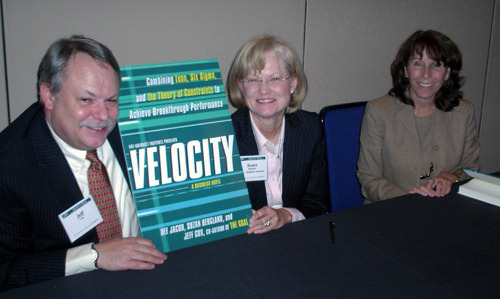 One of the authors of the business novel Velocity, Jeff Cox, was also co-author of Eli Goldratt’s bestseller The Goal. This book of the founder of the Theory of Constraints (TOC) is the mother of all business novels. If you are familiar with The Goal, you know what kind of plot to expect in such a book: A business under pressure, and a new manager who needs to realize a turnaround before it is too late. In Velocity the hero – a woman this time - is Amy Cieolara. She is promoted from sales manager to president of Hi-T composites in Oakton, a subsidiary of Winner’s corporation. Before she took the helm, there was a round of heavy cost cutting. This generated short-term results but the problems returned like a boomerang. In her mission to cope with these new problems, Amy works side-by-side with the corporate expert in Lean Six Sigma. This is Wayne Reese, her operations manager. The idea is that Amy and Wayne will implement Lean Six Sigma as soon as possible, to deal with the quality problems and customer complaints resulting from two years of cost cutting. Hi-T’s production plant is run by mister “Murphy” Maguire, a man with a long experience in manufacturing. Years ago, together with the former Hi-T president, he implemented a TOC-based production strategy to maximize the throughput. All plant resources were subordinated to the need of one critical (throughput-limiting) production step. Murphy found a way to by-pass Winner’s Manufacturing Enterprise System, which tries to optimize the utilization of all resources. Murphy focuses only on maximizing the throughput of the bottleneck process, because the velocity at this machine - named Godzilla - there determines the output overall. Then Wayne and his team of Black Belts arrive, to roll out the corporate Lean Six Sigma program! Initially, Murphy participates in the training program to learn the Lean-language. In addition, he thinks that is an opportunity to explain the TOC-principles to Wayne. This fails however. Murphy ends up quarreling with Wayne. After that he is assigned to a special project outside the production plant. Meanwhile, the Lean Six Sigma implementation is not delivering the expected results. This puts even more pressure on Amy to solve the quality problems. Then, there suddenly is a glimmer of hope. With the help of her friend and ex-marine Tom Dawson – he has both Lean Six Sigma and TOC experience - Amy learns step by step to combine the strengths of these manufacturing theories. Finally, she is able to solve the problems that way, although this is done mainly in the TOC-way (I will return to that later). ++ Velocity is to my knowledge the first book that recognizes that breakthrough results can be obtained by combination of the three main (logistic) manufacturing theories: Lean, Six Sigma and the TOC. In the literature I've read so far, especially the TOC remained isolated from the other theories. Although there is a natural overlap - one can for example put a Lean label on a TOC solution and vice versa - formal integration of the methods has not been described this way in a management book before. Velocity shows why it is needed to break with the paradigm of one single manufacturing theory. Therefore this book is also very suitable for those who are already familiar with Lean, Six Sigma or TOC, and want to bring process improvement to the next (breakthrough) level. 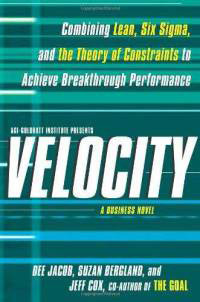 + Velocity is a business novel in the style of the famous bestseller The Goal of Eliyahu Goldratt, founder of the Theory of Constraints. Velocity is very readable, and a pleasant way to get familiar with the idea to join the merits of TOC, Lean and Six Sigma. Another similarity with the books of Goldratt: Velocity is a book that makes you think & reflect. +- The purpose of Velocity is to get inspired. For a real understanding of the different improvement theories, a more profound study of the individual methods is required. The examples of Lean and Six Sigma in the book mainly stress the pitfalls of these methods. Therefore, a follow-up study may help to envision how a combination of Lean, Six Sigma and the TOC can really accelerate improvement. Then, what is promised in the book title - Velocity - could become a reality. - The fact that the book is a novel facilitates the access to the ideas, but it is difficult to find key concepts back for re-reading and reference. Besides that, with 300 pages the book is rather thick. In an equivalent textbook the same ideas could have been presented in a more compact way. - In the end TOC emerges as the superior theory. This is no surprise, since the authors are consultants of the AGI Goldratt Institute. The examples of Lean and Six Sigma in the book are weak and don't show how these methods can really enhance a TOC implementation. This is a missed opportunity. In the end, the authors stress that TOC can strengthen an existing Lean Six Sigma implementation. The reason for this line of approach might wel be that there are far more existing Lean Six Sigma then TOC implementations. However, in my opinion, it is far better to formulate it the other way around. Use TOC to develop your strategy, then implement this strategy by applying practical Lean and Six Sigma tools. A solid ISO-system supports this approach. In applying the TOC, it is determined first what the current bottleneck is, which stands in the way to make more profit. Next, all the improvement efforts are focused on this business constraint. Implementation of the drum-buffer-rope principle, in which a bottleneck dictates the planning, is a good way to do this. Apart from that, the TOC does in my opinion not provide many practical tools to relieve or elevate a bottleneck. In my experience, this is where Lean and Six Sigma can be applied to strengthen the TOC! In the Oakton plant the autoclave Godzilla is the bottleneck operation, to which all other production processes are subordinated. Typical Lean implementations aim to eliminate activities that don’t add value to the final product, in the eye of the customer. Improvement opportunities are identified by making a Value Stream Map (VSM). So, the first thing Wayne and his black belts do is making such a VSM of their plant, to find the steps with a lot of muda (waste). Lean provides several practical tools to increase the Value Added Ratio of process steps. However, Lean does not have a way to establish priorities, like TOC. That is the reason for my personal plea to use TOC to determine the strategy. After that, Lean (or Six Sigma) tools can be used to improve the processes that have the biggest leverage effect. If such a selection is not made, Lean will result in an endless number of improvement projects. Six Sigma focuses on a reduction of variation, to achieve a tighter production control with less errors and more predictable outcomes. Lean and Six Sigma have synergies, and are therefore often combined to make production processes both efficient (Lean) and reliable (Six Sigma). In the book, Kurt is an adherent of this Lean Six Sigma approach. After he identified autoclave Godzilla as the key influencer of (quality) variation, he tries to bring the variation in batch processing times under control with Six Sigma. In this case applying Six Sigma however turns out to be a bad idea, since the variation is not caused by the process, but by the product specifications. This illustrates nicely what I think is a missed opportunity in the book. It contains few examples of a positive combination of the three manufacturing theories! Instead, the authors introduce an additional TOC tool: making a reality tree to determine cause-effect relationships and to find the root cause of problems. In the beginning of the book, the TOC is only applied in a traditional way, to maximally exploit a production bottleneck. The solution that is presented in the end is to use the TOC also as a broader strategic method to find business constraints. This switch to a more state-of-the-art application of the TOC is good, but in the context of the book it has a drawback: the description of the merits of the three manufacturing theories gets out of balance. Because so much accent is laid on the advantages of the TOC, Lean and especially Six Sigma are given less chance. As I said before, it is my personal experience that Lean and Six Sigma can be used to really accelerate a TOC implementation, as the book title Velocity suggests. Therefore it is a pity that there isn’t a story line in which Murphy (TOC) and Wayne (Lean Six Sigma) patch up their quarrel and start to work together! The strength of TOC is that it identifies autoclave Godzilla as the key operation within Hi-T. It is however strange that the people in the book decide “to live with this constraint”, instead of using Lean and Six Sigma tools to elevate it. For example, they could have used a SMED-analysis (from Lean) to accelerate loading/unloading of the autoclave. This would have reduced the set-up times. In addition, the R&D department could apply Design for Six Sigma to define minimal “soak-times” for the different products to be processed in the autoclave. That way, the reader would have seen how Lean and Six Sigma can be used to accelerate the throughput! That said, Velocity is still a very good book, a kind of a modern version of The Goal. Velocity is a book that you can give to colleagues if you want them to say goodbye to cost-cutting as primary improvement method. Show them that it is time for a paradigm shift: Increasing throughput and elevating business constraints should come first! This brings sometimes rather radical solutions. The responses of the main characters in the book nicely illustrate that a person only accepts such a solution when he or she understands the mechanism underpinning it. Once you “see” it the solution seems simple, but first you have to reach that stage. Velocity tells the story about the journey many companies try to undertake to turn things around, and I this case there is a happy end. Thank you for reviewing Velocity. Our background, which is rich in both TOC and Lean Six Sigma (LSS) methodologies, drives us to take a systems view. As Dr. Juran emphasized, the first step to improve a system is to stabilize it, while recognizing that there is variation in it. This stabilization can be done quickly by implementing a constraint-based architecture. As outlined in Goldratt’s book The Goal, after identifying the constraint, TOC "exploits" the constraint and subordinates everything else to it. Exploiting the system constraint means that we take advantage of it. We use it as an instrument to control and stabilize the system, rather than trying to eliminate the constraint immediately, which is the inclination of many people. If you do that, the opportunity to stabilize is lost. This is why elevating the constraint comes later (as fourth step in TOC's five focusing steps). There is a tendency among many to view the system constraint as an obstacle to productivity and throughput, but as long as the system constraint's capacity is equal to market demand, there will be no loss of potential throughput. More than that, a system with a constraint can be more productive. In many systems, exploiting the constraint is sufficient to meet the market demand, and LSS brings great value at this stage. With a stable system, improvements using Lean and Six Sigma can be targeted to have the maximum bottom line impact. If this is not enough, then the next step would be to elevate the constraint. Finally, our TOC-LSS methodology is based on cause-and-effect logic. In the book, Amy Cieolara and her management team develop their strategy for turning around the business using logic diagrams. Initially, these maps show that Hi-T should implement a constraint-based system architecture. Once Hi-T has stabilized the system that way, there is concern within the story that LSS will no longer be used. However at the end of Chapter 16, the management team adds the following into their logic map: “Prior to approval, we evaluate all improvement projects based on their ability to increase T, and to reduce I and OE – and on their ability to advance overall system performance.